At National Yang-Ming University Hospital, physician Chang Yea-yuan has been spearheading the fight against the overuse and inappropriate use of antibiotics that has led to the emergence of multidrug-resistant microbes. This means that the patient has contracted a so-called superbug, strains of bacteria that have become resistant to several types of antibiotic drugs. Standing at the bedside, Chang discusses with the attending physician and the nurse practitioner which “weapon” would be most appropriate to fight this virulent strain of bacteria. Due to the increase in multi-drug resistant bacteria, scenes like this have meanwhile become almost daily occurrences. Chang, the hospital's only infectious disease specialist, has even seen days with six or seven cases of superbug infection. Yet the heavy workload has not dented her resolve to take on the superbugs; after all this is what she sees as her mission. “If consulting with me was useless, they would not ask me to come. This constitutes an affirmation of infectious disease medicine on the part of clinical physicians,” she says. In each consultation, Chang is able to assist the attending physician in diagnosing an infectious disease more precisely as well as in selecting an antibiotic. This is an important step in reducing microbial resistance to antibiotics. "It’s not about using expensive drugs or drugs of last defense, but using the right drug in the right place,” Chang says. Chang, who always speaks in a calm and confident manner, collaborates closely with her coworkers. She joined the hospital in Ilan on Taiwan’s northeastern coast a little more than a year ago, transferring from Taipei Veterans General Hospital, just as the hospital was participating in the Antibiotics Stewardship Plan promoted by Taiwan’s Centers for Disease Control (CDC). In Ilan, the young physician assumed the helm of the Department of Infection Control, where she implements the program with the support of two infection control practitioners. Since the plan’s implementation began, antibiotics use at the hospital has improved markedly, as has the infection situation. At the hospital the appropriate use of restricted antibiotics has increased to 90 percent up from 70 percent in 2014. At the same time, the drug resistance of several hospital superbugs has declined. Of these, the rate of antibiotic resistance for the very powerful superbug carbapenem-resistant Acinetobacter baumannii, also known as CRAB, declined 4 percentage points to 50.7 percent of infections treated at the hospital in the period from September 2013 to September 2014. In comparison to a resistance rate of 58 percent at other hospitals, which also participated in the antibiotic stewardship program, this is a rather low figure. How can a single infectious disease specialist score such success? This is particularly impressive if one considers the formidable challenge for large hospitals to make the medical personnel of all hospital departments change their habits with regard to antibiotics use. Persuading other, much senior physicians was not easy for Chang. However, she had strong backing for her mission from the hospital president, who was determined to implement the CDC’s Antibiotic Stewardship Program. The team implemented changes throughout the hospital process in a well-organized campaign. 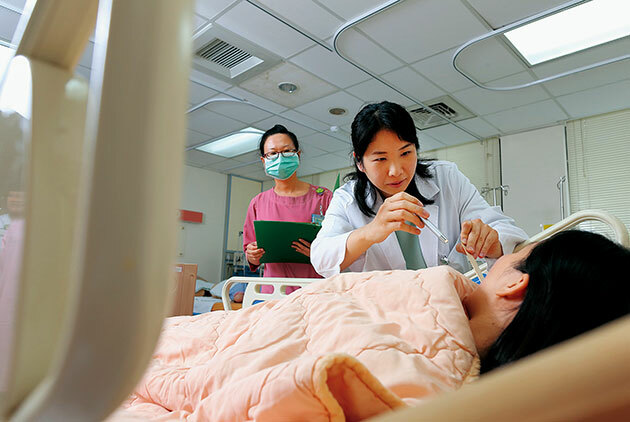 “They are small but beautiful,” comments Liao Hsun-hsiang, deputy executive manager of the Joint Commission on Hospital Accreditation of Taiwan (JCT). “Here I have seen the infectious disease specialist bring her values into full play, guiding the team in making changes and completing its mission,” Liao says. In a first step, laboratory tests were sped up. The testing staff must work frantically against time so that the medical teams fighting an infection can quickly pick the right “weapon” to prevent inappropriate antibiotic use. Isolation measures also serve to contain the spread of superbugs. The “detectives” of the medical laboratory department investigate the blood, urine and sputum of infected patients to determine whether a patient has contracted a superbug. Thanks to the acquisition of additional laboratory equipment and testing devices as well as efforts to ensure sample quality, the hospital has been able to shorten the time from registering a sample to reporting the results to 9, 23, and 26 hours, respectively, depending on the type of test. Before starting a bacterial sputum culture, for instance, special dyes are used on the samples to eliminate specimens that have been contaminated by saliva. Modified containers with wider openings are now used for urine samples to ensure that patients collect enough urine without contaminating the specimen. Under a strict lab sample receipt procedure, laboratory personnel must process samples within two hours of receiving them. Risks from improper equipment operation have been reduced by procuring new fully automatized testing devices. Thanks to the upgrades, the number of bacteria types that can be identified has increased from several dozens to more than a hundred, leading to more accurate lab results. Once the lab report is out, it is posted in the system, and an SMS message is sent to the medical team for immediate action. A fast exchange of crucial information is only possible if a proper information system has been set up inside a hospital. This is the second step in effecting change. It took one and a half years to establish an information system and fine-tune it to accommodate the needs of different hospital departments. Now, medical personnel only need to open the system to call up medical records and lab reports, the reasons for the prescription of antibiotics, reviews, as well as the spatial distribution of hospital beds with patients infected with superbugs. They can see all relevant information at a glance, which saves time that was previously spent on switching between different systems or communicating with different members of a medical team. Thanks to this customized system, antibiotic drug use and patient management have become more efficient despite limited human resources. Medical personnel are also able to save considerable time on documentation processes, valuable time that is better spent on patient care. Last year, the hospital won the JCT’s innovation award for this customized information system. “There’s nothing that the system can’t do, there’s only things that we can’t predict.” notes Tsai Ping-huang, director of the hospital’s Department of Information. The system allows Chang to check all information pertaining to antibiotic drug use in a given month, which could be several hundred or several thousand cases, thus gaining insight into the overall utilization of antibiotics at the hospital. Based on this data, Chang can analyze details that often go unnoticed, such as which last-resort antibiotics the hospital’s physicians prescribe most often and which dosages they use. These figures can then be discussed in meetings, and, if deemed necessary, relevant adjustments can be made. “It is a bit like playing detective; you are looking for all kinds of clues, and when you have found them, you make changes,” Chang explains. As Chang continued to investigate how to contain the spread of superbugs, she discovered a hygiene loophole. “In quantitative terms, the use of last-resort antibiotics declined, but strangely there was no clear decline in the ratio of resistant microorganisms,” recalls Chang. Puzzled by her discovery, Chang set out to find an explanation. She soon found out that outsourced cleaning services constituted a big problem. Workforce fluctuation is high in the cleaning services sector, with many jobs being filled by elderly part-time workers. As a result, incorrect techniques and wrong equipment are often used, or cleaning procedures leave out important details. Places with poor hygiene can become a breeding ground for bacteria, increasing the risk of infection. In the third step, Chang teamed up with the general affairs office and the nurse practitioners to push for a reform of hospital cleaning. They picked cleaning workers with a good record and trained them in a one-on-two setting to ensure that newcomers are quickly familiarized with their new jobs. Cleaners have been equipped with picture cards showing the order of the different steps in the cleaning procedure as well as places that require special attention because they tend to become superbug breeding grounds (such as the lid of the hand sanitizer in the ICU or the bed-side call button.) The cleaning equipment has also been labeled with the same information, constantly reminding the cleaners to practice good hygiene. The medical team conducts random hygiene checks, using luminescent ATP testing kits to verify whether surfaces have been cleaned properly. Should microbial contamination be detected, the cleaning personnel will be shown where the problems occurred and instructed how to improve the cleaning procedure. The hospital also uses “mystery shoppers” to check on compliance with cleaning requirements. “Very often, the most basic things are the most important ones,” observes the JCT’s Liao. Numerous hospitals have outsourced their cleaning services to save costs. National Yang-Ming University Hospital, however, is squarely facing the resulting hygiene problems. By paying attention to detail and taking relevant action, the hospital has been able to effectively crack down on superbugs. In her relentless fight against superbugs, Chang cannot relax just yet.